You may have noticed that I’ve enabled notifications throughout the site in the last week or so. As I mentioned in my last weekly update, I thought I’d post a bit of a walkthrough explaining how notifications work and what exactly you’re looking at. First things first, you’ll need to register on the site to be able to actually start receiving notifications. Since notifications are based on responses from other authors to content you’ve created, comments you’ve posted, or items you’ve favourited or bookmarked, it stands to reason that you’ll need to be a member for all of this to work. Of course, signing up for Protagonize is free, so all of this comes at no charge to you. The first thing you’ll notice (assuming you’re logged in) is the “new for you” box showing up above the Hot Stories listing on the homepage. This gets updated, unsurprisingly, every time you login to the site. At the very bottom of the box, you’ll see a link showing how many unread notifications you have. If you haven’t posted anything yet, not to fear — your notifications will still start showing up once you add a favourite author or story, bookmark a chapter or branch, comment on a post, or any other kind of site interaction. There are various types of notifications you can receive, but they match up to the email notifications list on your profile (Edit Profile -> Notifications). If you find you’re receiving more email than you’d like from the site, you can disable all of your email notifications and you’ll still receive site-based notifications when you login, so nothing is lost and you’ll always be able to get caught up with changes since your last login. 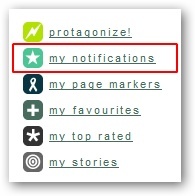 The other shiny new trinket you’ll find on all pages is the link to “My Notifications” in the right navigation bar. This one’s pretty straightforward. You click the link, it does its magic and shows you all of your unread notifications. On top of that, you’ll also get all of your notifications for the last 7 days, and an indicator to let you know which ones are new. Now for the big one: the actual list of notifications. The first thing you’ll notice is that it’s broken down by date, then by time, in descending order. The newest and unread notifications will always be at the top of the list so you can check them out quickly and easily, and get caught up with your favourite authors’ postings. Unread notifications (i.e. posted since your last login) show up with a * indicator beside them. Those will go away automatically once you’ve read the notification. Here’s a quick breakdown of the types of notifications you’ll see (and yes, this is word-for-word from the Edit Profile -> Notifications page). 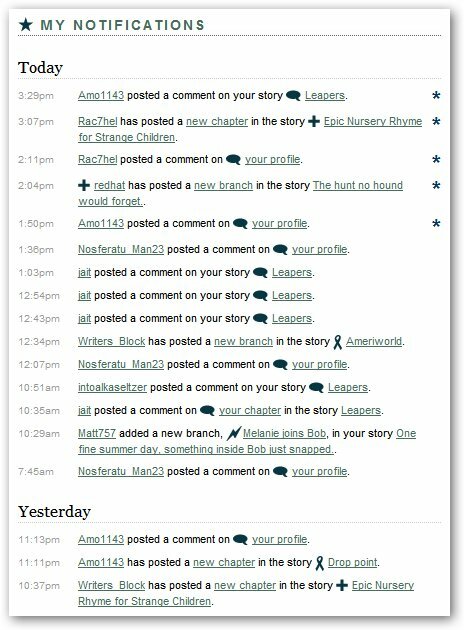 You’ll also notice that every notification is linked up so that you can see exactly who posted what, when and where. 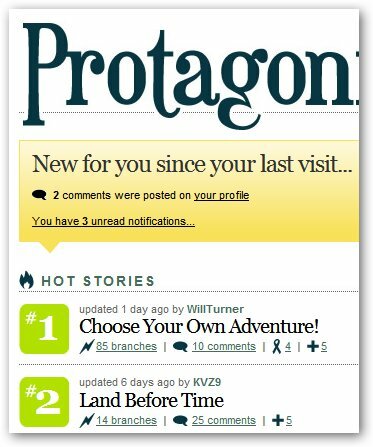 Icons next to links are there to let you know if a favourite story was updated, a favourite author posted something new, or a branch was added after your page marker. If someone added a comment, you can jump straight to it. The main thing to keep in mind here is that even if you’ve disabled email notifications on some of these in your profile settings, you’ll still get the notification on the web site itself. Before you ask (and I know you were thinking about it! ), yes, I plan on making this notifications stream into an RSS feed you can subscribe to down the road. It will require a little re-jiggering of our feeds system to allow you to subscribe to what is effectively private content, but it’ll happen sometime relatively soon. This entry was posted in Features, General, Site updates, Tutorials & Walkthroughs and tagged Features, howto, notifications, protagonize, tutorial, walkthrough. Bookmark the permalink.